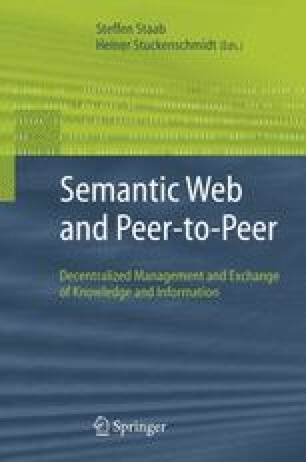 Research on the Semantic Web has focused on reasoning about data that is semantically annotated in the RDF data model, with concepts and properties specified in rich ontology languages such as OWL. However, to flourish, the Semantic Web needs to provide interoperability both between sites with different ontologies and with existing, non-RDF data and the applications operating on them. To achieve this, we are faced with two problems. First, most of the world’s data is available not in RDF but in XML; XML and the applications consuming it rely not only on the domain structure of the data, but also on its document structure. Hence, to provide interoperability between such sources, we must map between both their domain structures and their document structures. Second, data management practitioners often prefer to exchange data through local point-to-point data translations, rather than mapping to common mediated schemas or ontologies. In this chapter, we present the Piazza system, which addresses the challenges of mediating between data sources on the Semantic Web by mapping both the domain structure and document structure. A key aspect of Piazza is its support for mapping between XML data and RDF data that is accompanied by OWL ontology definitions. Mappings in are provided at a local scale between small sets of nodes, and Piazza’s query answering algorithm is able to chain sets mappings together to obtain relevant data from across the system. We describe our experiences with the prototype Piazza system and a data sharing scenario implemented using it.